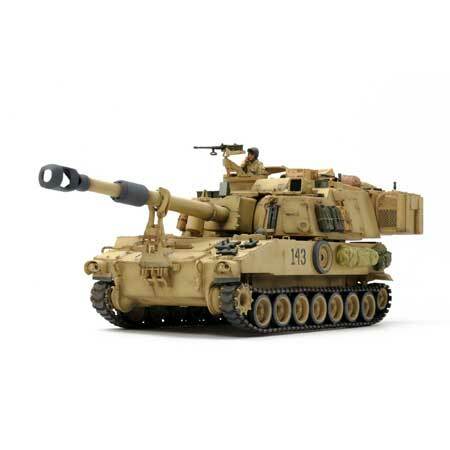 This model kit recreates the U.S. Self-Propelled Howitzer M109A6 Paladinin in 1/35 scale. The kit itself is from the Tamiya-Italeri series. It further updates the original release from 2012 with more molding improvements, brand new parts, and even photo-etched parts included! Of course, it also includes Tamiya figures, accessories, full instruction manual, and decals, all packaged in a new Tamiya box! Deployed from 1992 onwards, the M109A6 continued a series of self-propelled howitzers that started in 1950. The L/39 155mm gun has a range of 30km, used effectively in supporting fire roles in the Iraq War of 2003.